Why Is Lionel Messi Football Index most expensive player? Read This! Although it’s a new concept recently introduced to Football Index, Lionel Messi is stamping his mark on Performance Buzz. Only Cristiano Ronaldo can put up a fair argument that he isn’t the best of all time, but one thing is for sure, in my lifetime I won’t see a better pair of footballers! Messi is not a ‘media man’, he currently has 70% less media buzz wins in comparison to Ronaldo & Neymar. He gained some media attention due to his Tax issues, but he makes headlines while on the pitch. However, more recently he has gained media attention, due to speculation with a move to Man City. As he’s classed as the best player in the world, he will be in the eye of the media consistently. His share price is very high, leading to the question of whether it’s still worth your time investing in this player. Before Performance Buzz, there wasn’t actually a great reason for owning Messi. He couldn’t be relied on for delivering Media Buzz dividends, so the money was being put on other players. Taking a look at the above graph, we can see what the impact of Performance Buzz has on the share price. Performance Buzz was introduced Late August, just watch that graph rise! Messi shot to £6, then there was an update by Football Index who concluded that all share dividends would be doubled, meaning we get more payouts on our players! 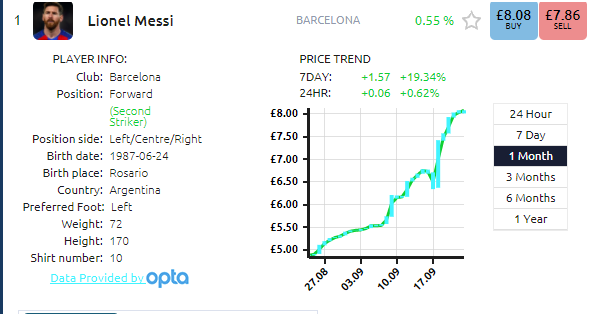 This caused another £2 to be added onto Messi’s price, as he is the main man! In 4 games, Messi has picked up Three ‘Best Forward’ dividends, aswell as Two ‘Star Player’ dividends. He has really kicked things off with a dividends spree for all owners! The Performance Buzz scoring system really suits Messi, who is an all round talisman for Barcelona. He’s not a tap in merchant, he can pick the ball up in defence and create a tally of passes, which all add to Performance Buzz scores. He is a far better option than a ‘Giroud’ style player, who pops up with important goals, but doesn’t contribute much other than this. YES, I JUST COMPARED MESSI TO GIROUD! Should I Invest in Ronaldo Instead? I’m not one for getting caught up in these discussions, as I believe they are completely different players. They are both great. Cristiano Ronaldo is a Media Buzz star, he loves attention and this means the media are quick to write a story up about him. Ronaldo has made himself into a brand (CR7), so he will always be in the eye of the media. Also, as he has previous links to Man Utd, the press will always link a story of an emotional transfer ‘back home’, as it grips the football world! Regarding performance buzz, this is something which doesn’t suit Cristiano’s style of play. I see Ronaldo as a ‘finisher’, sure he can run, but he doesn’t give the ball up easily and often loses it, meaning negative scores. Compared to Messi, who will rack up many passes in Tiki-Taka system. Messi will outscore Ronaldo for Performance Buzz 8 times out of 10. Messi will outscore Ronaldo for Media Buzz 8 times out of 10. If you have both of these on your portfolio, you have a very strong chance of dividends! The only ‘negative’ about Messi is his share price. I haven’t invested in him myself, as I cannot justify the £8 share price for a 4p/6p/8p payout! I would rather split that up over various other players, but best of luck if you acquire Messi. This cannot be used in conjunction with other promotions. Messi is a fantastic player, he performs well consistently. This means he will attract many dividend payouts, however, at the price of over £8, can you realistically invest in this player? I personally don’t hold any futures in Messi, I feel like I missed the boat at £5, then he rushed to £8!